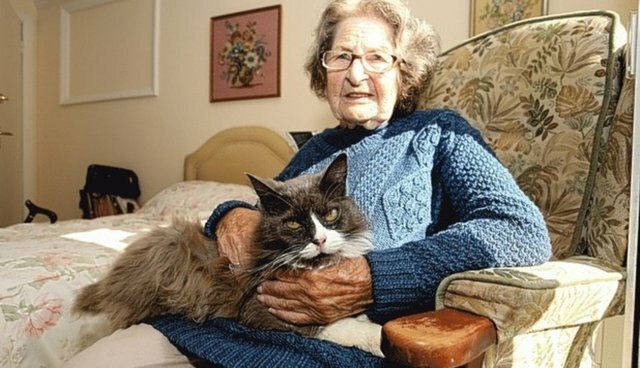 In a remarkable tale of loyalty - one which underscores the deep bonds between pets and their owners - a fluffy grey-and-white cat was able to track down her elderly owner weeks after she was sent to live in a nursing home. A few months back, when Nancy Cowen was placed under the care of staff at the Bramley House nursing facility in Westcott, England, she was forced to say goodbye to her loveable cat, named Cleo, whom she had adopted as a stray eight years earlier. Cowen's family had given the feline to one of her neighbors to take care of, reports the Dorking Advertiser - but Cleo clearly had other plans. Staff at the home tells The Dodo that about two weeks after Cowen moved in, they began receiving visits from a friendly feline who lingered and slept out front, spending her days wandering the grounds peering through windows of the home. Naturally, they had presumed the cat was just a stray, but a sweet one at that. "She'd been sort of hanging around, and the care staff started feeding her, obviously, because she's so cute," says caregiver Leslie Thomas. A few weeks later, Nancy met the cat and remarked to staff that she had a striking resemblance to the pet she'd been forced to leave behind. "One day Nancy said ‘Oh, she looks just like my cat, Cleo. But my Cleo had lost most of her tail.' So we checked, and the cat was missing most of her tail," says Thomas. "That's when we realized that it was Cleo." Bramley House care staff were stunned at the discovery. "I think it is just amazing that Cleo found Nancy. Obviously, Cleo knew Nancy was here, but nobody knew that it was her cat. Very strange. I don't know how Cleo found her. It still baffles me. It's really, really weird," caregiver Laura Costello tells The Dodo. "There's no way she could have followed her, since it's quite a ways from where Nancy used to live before she came here." The jury is still out on just how Cleo, the incredibly faithful cat, managed to find her owner - but care staff say they have no plans on ending the happy reunion. Cleo has been invited to stay with Cowen full time; in fact, she's hardly left her owner's side since. "We were all absolutely delighted. We all thought it was wonderful," says Thomas. "There are a lot of bad stories in the world, but this is a nice one."